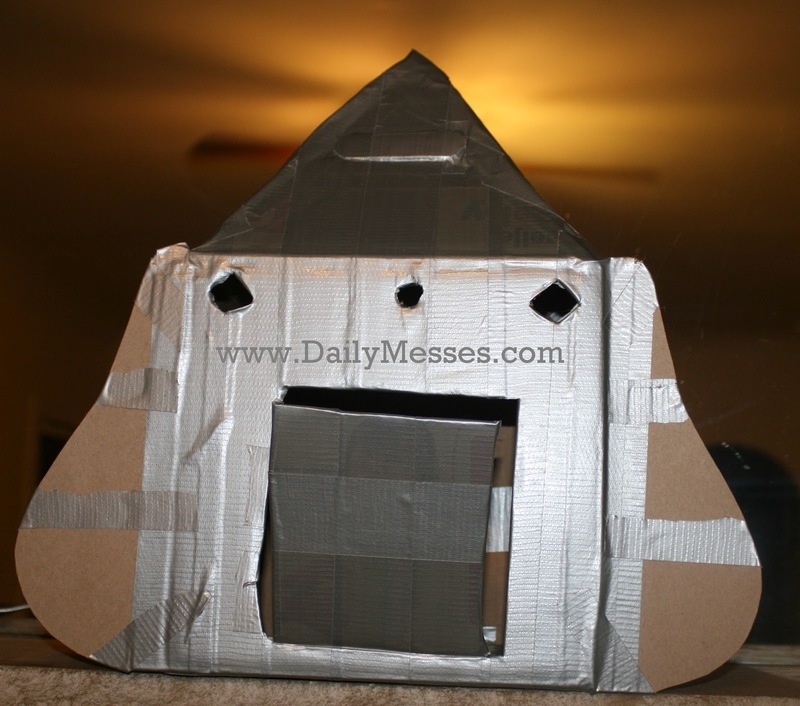 I was going through some older pictures and came across the cardboard rocket/space ship we made a few years ago. We had lots of fun making it! Duct tape. I used silver because that's what we had in the basement, but there are a ton of different colors and designs out there now! Amazon carries lots of different types of duct tape! 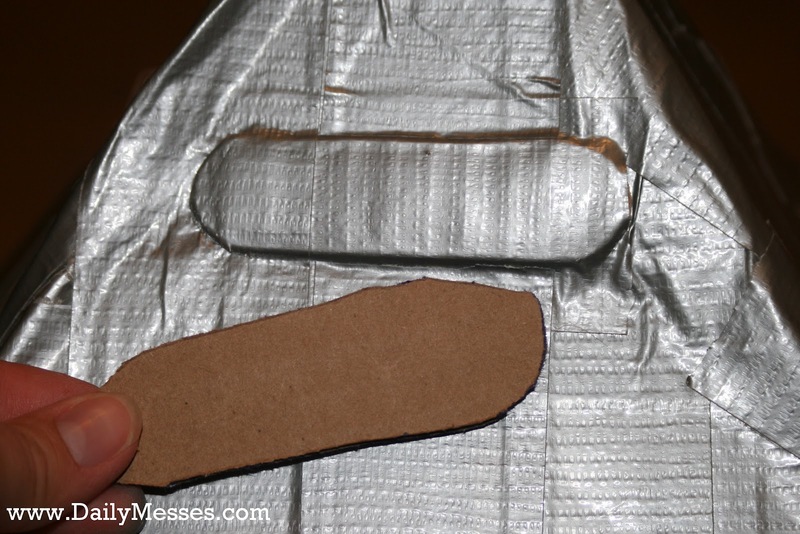 Duct tape sheets (optional: it will probably make it easier to cover with sheets than to keep tearing off pieces of duct tape). Amazon.com carries a few options, and your local hardware/craft/grocery store might carry some as well. 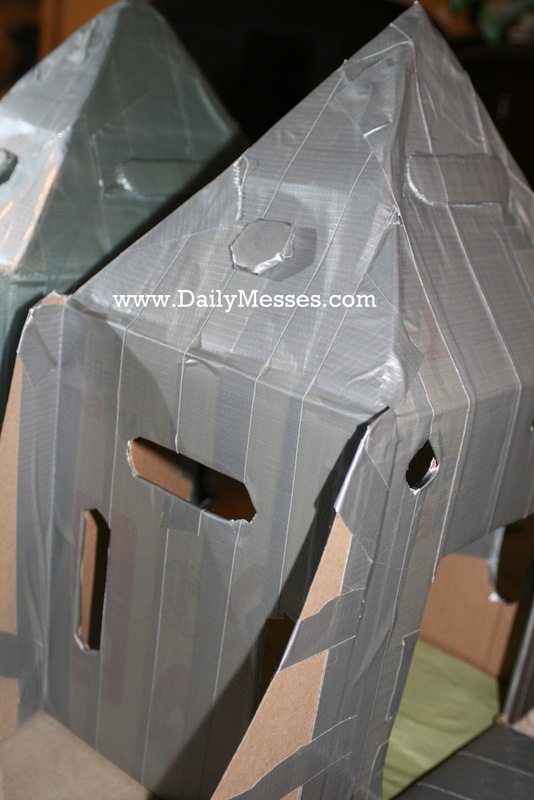 Scrap pieces of cardboard (for example, flaps from other cardboard boxes). These will be used for the fins of the rocket ship, as well as finishing the peak (if needed). 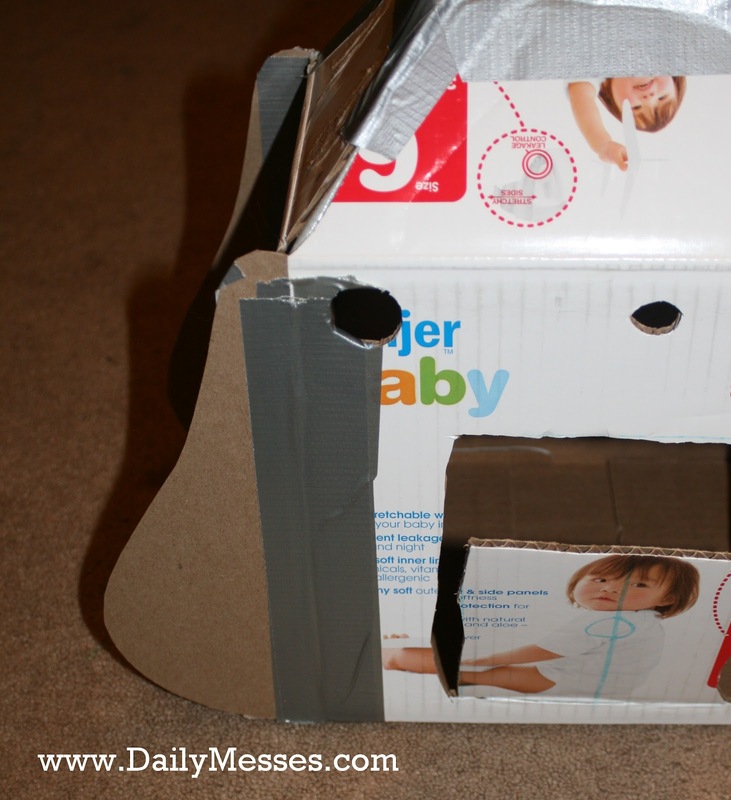 HINT: If you have a Build-a-Bear box, it would work great for this craft! Or for a more traditional rocket shape, use an oatmeal box/tube. 2. 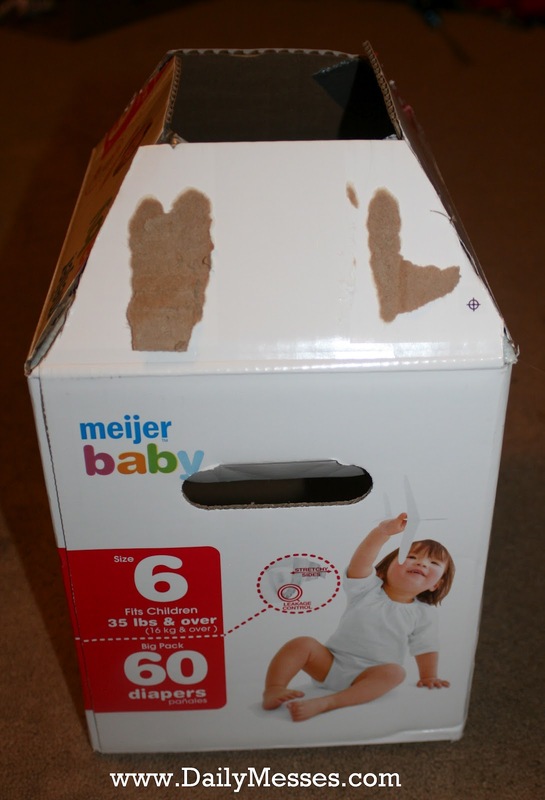 Trim the top flaps of the box to form a peak. Tape together. 3. If needed, cut and tape on extra pieces of cardboard to complete the peak. 4. Next, cut out fins for the rocket ship. I used pieces of thin cardboard I had, but a thick cardstock might work well too. 5. Tape the fins on. 6. Decorate the rocket ship. I covered (almost) my entire ship in duct tape. (Higgins got impatient, so the wings/fins didn't get completely covered.) I also used a few scrap pieces of cardboard to add embellishments. I used a roll of duct tape to decorate the ship (well, about 1/2 a roll). The duct tape sheets may be easier to use! 7. 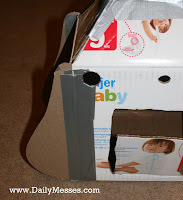 If wanted, cut a piece of decorative paper or construction paper and tape to the inside floor of the ship. As a side note, my flip down door didn't stay shut enough for Higgins. He complained his toys fell out while flying. I poked a hole above the door with the craft knife. 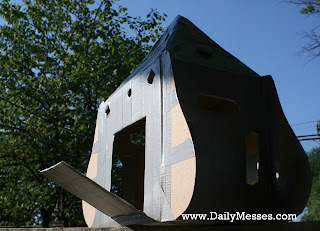 I then covered a piece of scrap cardboard with duct tape and poked a hole in one end. I pushed a brad through and attached above the doorway. 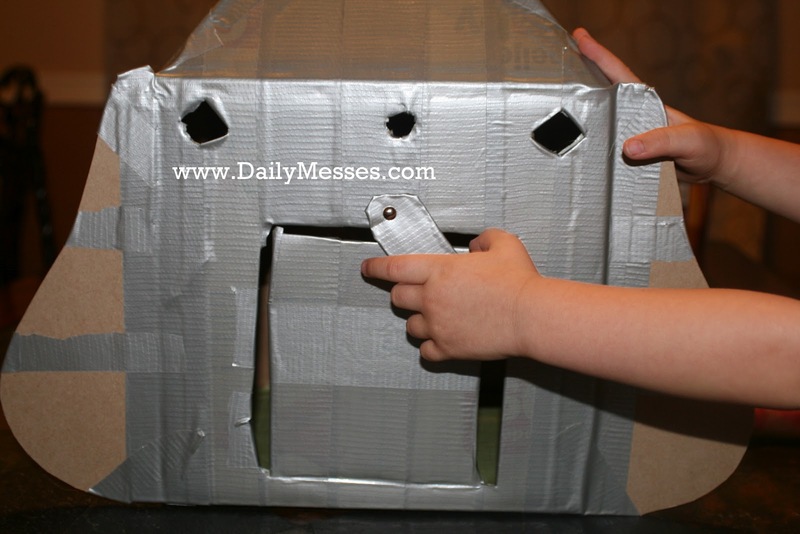 Once all his toys are inside, he can close the door, push the flap down, and keep them secure!